Social unrest, political fragmentation, drug trafficking, and violence all characterized the late 70’s in Bolivia. All of the major parties failed to gain a majority vote, coups were attempted with an alarming frequency, and human rights violations were severe and widespread. In the early 80’s, Bolivia transitioned to democracy, but that transition was far from smooth. In a 1997 interview with Charles Stuart Kennedy, Alexander Watson (Deputy Chief of Mission in La Paz, Bolivia 1979-1981) discusses the turbulent course of events, beginning with a coup on June 20, 1980, how he gave the keys to his house to certain political leaders, the change in policy after Ronald Reagan’s election and the eventual collapse of the coup plotters. In the middle of this situation, I remember I became ill for a moment with what appeared to be some kind of a heart condition […] one morning I felt at my desk that something of a strap had been wrapped around my chest and I couldn’t take deep breaths […] the State Department doctor […] gave me an EKG and said, Oh, my God I think there is something wrong with you. He shot me over to the intensive care unit of the clinic […] I went to Georgetown and had to take several weeks completely off and then come back for some tests […] by mid-June of 1980 they had said I could go back to work, but I had to sort of ease my way back in. What happened then, just when I got this word, is that Garcia Meza moved and they had the coup on June 20 I think it was of 1980. We quickly made the decision that I should get back there. They should remove Marvin Weissman before they declare him persona non grata. We should take the initiative and remove him to preempt. This would make it our political statement and not theirs. I had to get back down there immediately. So, rather than easing back in I had to go charging back in. I flew immediately down overnight. We could not land in La Paz because of the chaos there. I had to land in Santiago, Chile, slept on the bench in the Santiago airport, flew from Santiago into La Paz the next morning in time to go and see Marvin and his wife and bid them farewell as they left. From that point on I was in charge of the embassy. We drew down the military mission completely and […] ended all of our programs there except those that went around the government and directly to the people or had dealt with kinds of housing or programs that would really totally collapse if we did not maintain them over some period of time. We pulled out all of our DEA people against my recommendation. I wanted to keep at least one or two there and ended up that I had to perform the functions of the DEA that is to say paying informants myself which I had never done before because while I had no DEA people there, they still wanted these certain functions to be performed. It was really a wild time. The military plotting did not stop of course. The other military factions rallied against Garcia Meza and wanted to have the U.S. blessing for their efforts to overthrow him. I was meeting all the time semi-secretly with all sorts of political and military leaders. Garcia Meza’s regime was absolutely brutal. He was a gross violator of human rights. The Argentine regime that was in power at that time was an accomplice up to its ears in the coup. They had people inside the interior ministry and Argentines were engaged in the torture of people at the military headquarters in downtown La Paz I know for a fact. We had excellent information as to what was going on inside that place. The regime itself was engaged in drug trafficking. The former army intelligence chief Luis Arce Gomez became interior minister. He had his own fleet of 13 airplanes flying cocaine from a base up in Colombia where it was refined. They were stealing everything in sight. It was absolute, almost if it wasn’t so tragic, a cartoon of what a corrupt incompetent Latin American military regime would be like. It was extremely difficult for us. 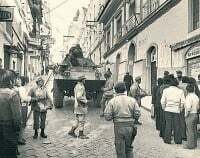 When the military coup took place among the other things that occurred was that the students in the military academy starting roaming around the town attacking certain spots including the American commissary. The pilot for military aircraft […] came out to see what was going on and they shot him in the face. Fortunately the bullet went right parallel to his teeth and into his cheek and the front of his mouth and out the back of his check and didn’t even break any teeth or bone, but that was pretty serious. They also raided our commissary and stole most of the liquor that was in it. They destroyed the kindergarten, the embassy kindergarten which was on the ground floor of the building. So, anyhow, the U.S. government set some requirements for any incipient normalization of relations with the Garcia Meza regime. Those conditions involved ending the human rights violations that were taking place all over the country brutally. Beginning the process of returning the country to a democratic, civilian government, taking some steps against narcotics trafficking which was kind of a joke because the regime was intimately involved in the trafficking itself. Then the State Department against my advice also said they should have some rational economic policies. I thought that was on the lower level of things that were much more difficult to attain in short order. […] I said I wanted $45,000 to repair the kindergarten and replace everything they stole out of our commissary. I gave the keys to my house to several people who will go unnamed, political leaders that if they ever needed to, they could come in the back way and hide in our basement even though they’re not supposed to do that. There were hundreds of people, political leaders in asylum in Venezuelan, Mexican and French and other embassies. It was a chaotic situation. The fact that the U.S. political scene would have to be, the Garcia Meza folks were banking on a victory by Ronald Reagan in the U.S. and anticipating that that would bring a change in the U.S. attitude toward them. 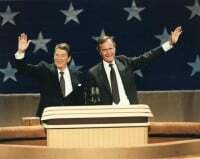 President Reagan did win the election. He did take office in January of 1981 and Senator Jesse Helms had sent some of his henchmen down there and had been collaborating and was showing sympathy with people that became leaders of the Garcia Meza government, including Luis Arce Gomez who on 60 Minutes subsequently was called the minister of cocaine and it was an interesting piece back in those days. […] All this gave heart to the ultra conservative forces around and the Garcia Meza people, that with President Reagan came, things would change. Well, obviously the first thing on the new administration’s mind is not Bolivia, so they did not get to it right away although there were some interesting things that happened. The Secretary of State, Alexander Haig, apparently invited General Gordon Sumner to the so-called Santa Fe group of conservative intellectuals who had written a proposal for U.S. policy toward Latin America. […] Secretary of State Alexander Haig asked General Gordon Sumner if he would become a member and if he would be willing to be ambassador to Bolivia. This was really a stupid thing to do because there was no reason the Reagan administration should be getting itself tarred with the Garcia brush by normalizing relations without giving any thought to the process. This only came to the attention of the people on the Bolivia desk when General Sumner’s letter sent back to Secretary Haig declining his kind offer was bumped down by the executive secretariat to the desk. It was the first time anyone had heard any of this. In any case I had shifted during the Carter administration. I had been reporting rather fully from the embassy what was going on in the political front and the democracy right and the human rights violations, the narcotics front. When the Reagan administration came in they really hit with a vengeance. They wanted to do everything opposite of what Carter was doing. It was almost a knee-jerk reaction was my perception from my vantage point. So, I tried to shift. The Reagan administration had not become a very vociferous opponent of human rights. At that point that was an idea that was sort of associated with Carter and therefore not something that they were paying much attention to, even though later on the Reagan people came to understand what a powerful instrument it was for fostering democracy and U.S. interests around the world. In any case, at that point they were not talking that way, so I shifted the emphasis and put more on the narcotics traffic and I thought that would catch their attention. I still wasn’t viewed very well. 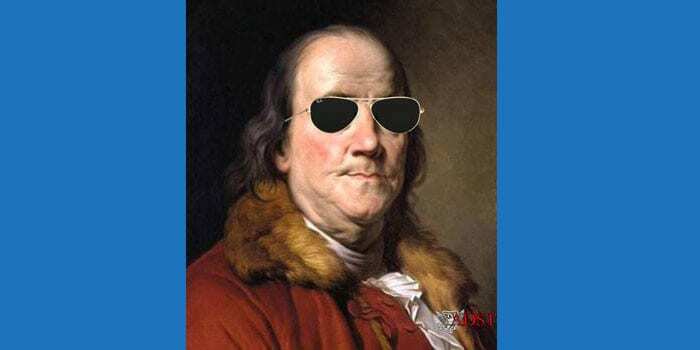 I think I was viewed, even though I was a career Foreign Service Officer, as a holdover from the Carter administration. An interesting event took place. 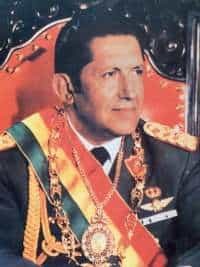 General Hugo Banzer who is currently president of Bolivia was also opposed to this military coup having been a military dictator himself in the ‘70s. He was opposed to this one now because he wanted to become democratically elected and of course he had nothing to do with Garcia Meza. Banzer had a great deal of credibility with certain groups in Washington including a group that had General Sumner as the head of and so he probably had more credibility in those groups than certainly a career Foreign Service Officer, Alex Watson, did. I went down with my wife to Santa Cruz to see Banzer. This was like something out of a B movie because this was supposed to be secret and my wife was going with me and I think my kid went, too. I went ostensibly just to go off on a few days holiday down at the hotel in Santa Cruz and during that time met with Banzer. When it became clear in about July of 1981 that the Reagan was not going to normalize relations with the Garcia regime, that was the beginning of the end. In August the regime collapsed. It was replaced by a triumvirate of the army, navy and air force commanders, which lasted for about a month or two. The decision was made at that point to appoint an ambassador to Bolivia and Ed Corr was to be sent up from Peru as ambassador to Bolivia and Bill Price was coming in […] to replace me as DCM and I was to move onto Colombia which I did. Bill Price and I overlapped a few weeks so I could introduce him around in this chaotic situation and then I moved on down to Lima […] The very day that I flew down from Bolivia to Lima the army commander, Celso Torrelio, assumed power for himself and removing the other two from the triumvirate. 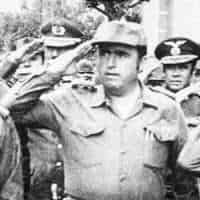 He lasted a very short time before another military movement led by General Guido Vildoso Calderon came up and threw out Torrelio and then that led to the restoration of democracy in 1982. Hernán Siles who had won the election in 1980 eventually came to power.